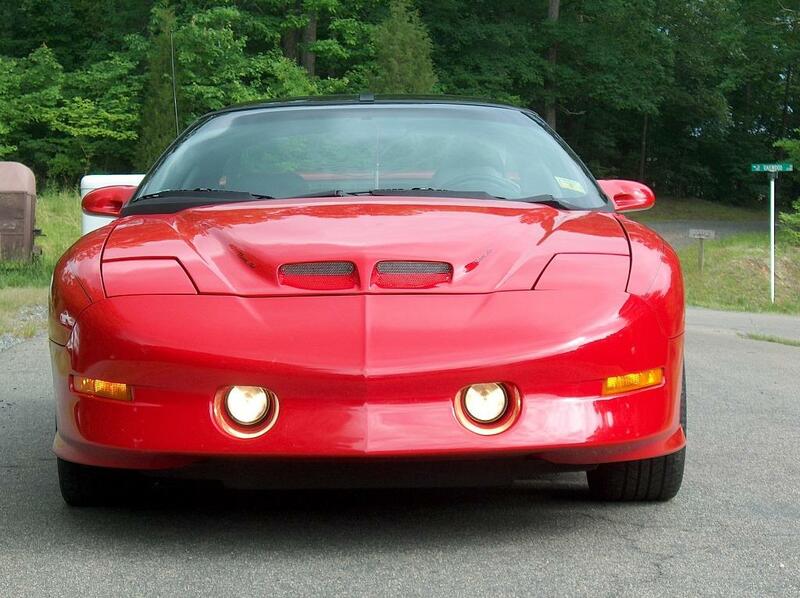 This is Kerry South's Trans Am. 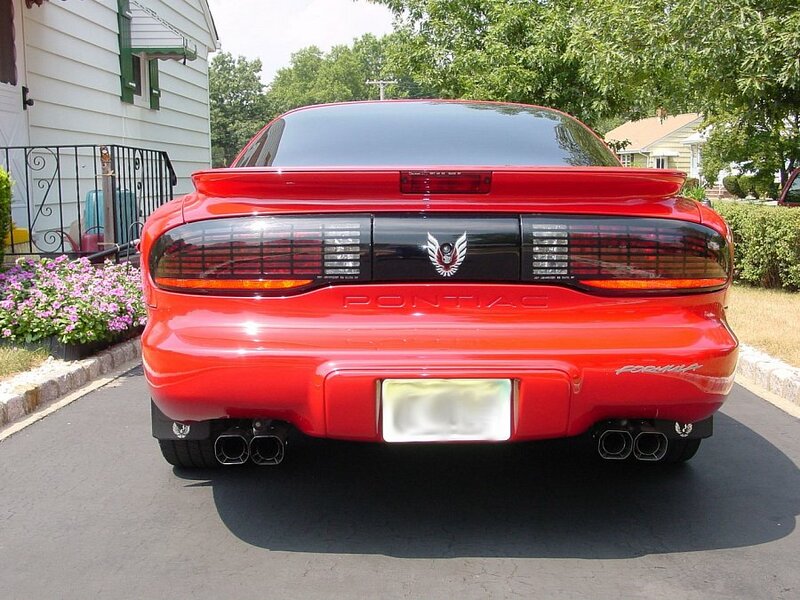 The bright red paint and gray leather interior are more than enough to make any Firebird lovers mouth water. However the fun doesn't stop there. This beauty also comes with T-Tops, a 10 speaker performance sound system and the optional 6-speed transmission. 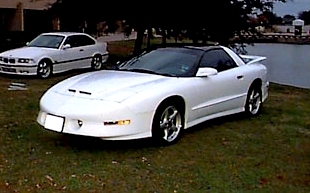 Kerry also owns a 1988 GTA (see it on '88 Firebirds Lot#1). Kerry hosts his own web page called Kerry's Trans Am GTA Page. Stop by and check it out. 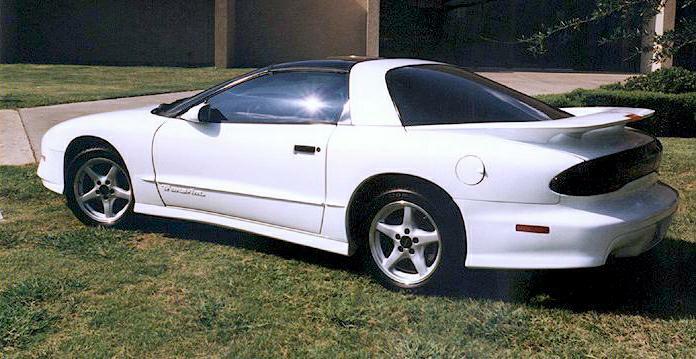 "My car is a '95 Trans Am. Modifications include new Corsa cat-back exhaust, shaved heads, trans shift kit, 160 degree thermostat, SLP Ram Air & Polished Stainless Steel scoop grills. 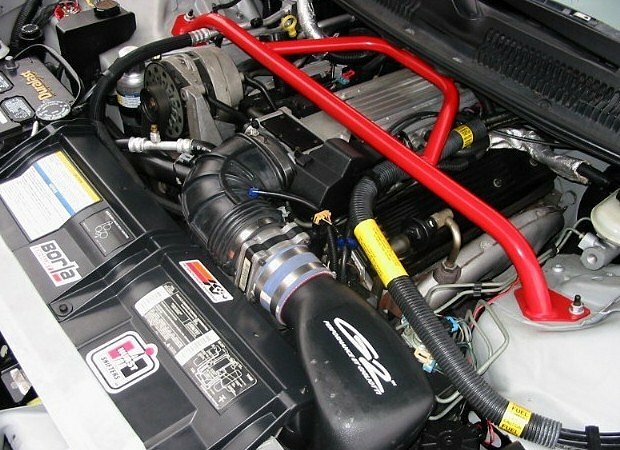 My dad's company makes the injector covers and strut tower brace. 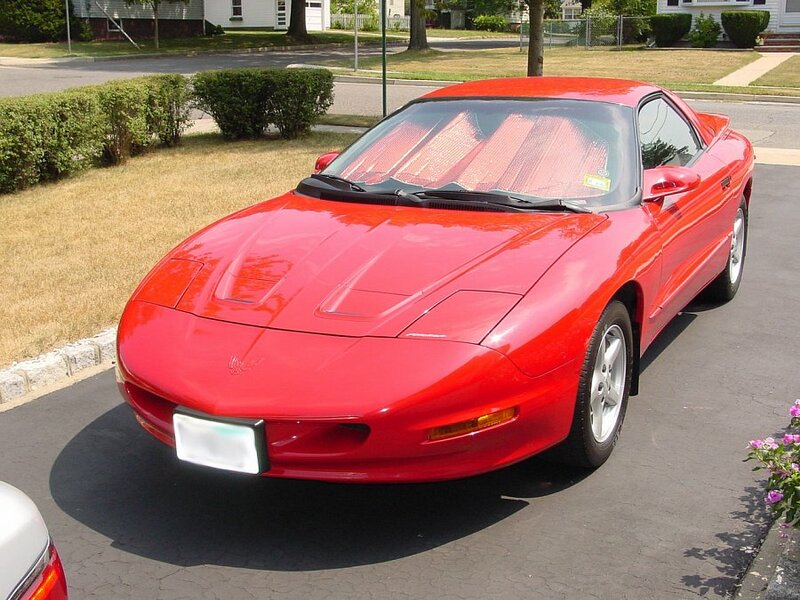 The car has a gray leather interior and is automatic." 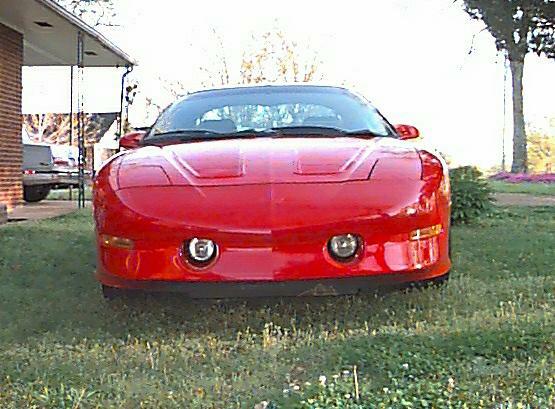 and wanted something different then standard straight racing stripes. Also the aluminum wheels have been polished and the rims painted black which has a nice effect. The car has 178,000 miles but runs good. 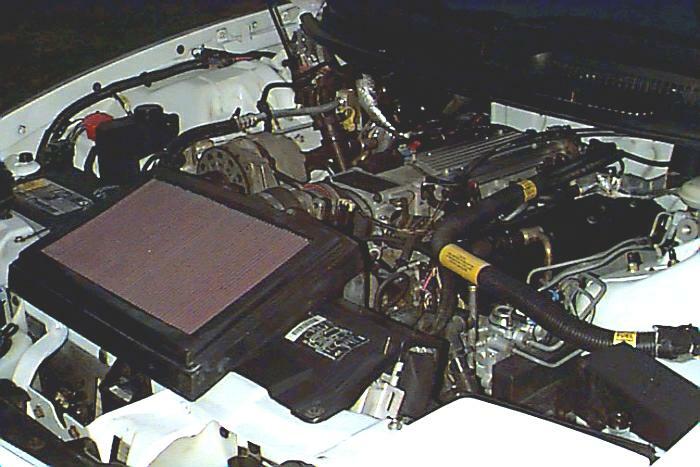 The only mods are the replacement of the exhaust system with a Flowmaster muffler and 2.5 inch pipes, the K & N air filter and the heated air intake bypass. Of course the skip shift has been disabled. 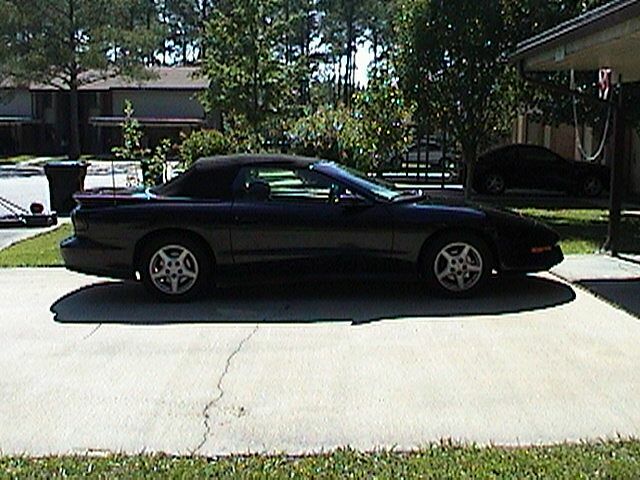 The six speed manual is smooth running and it still can smoke the tires when I feel the need." 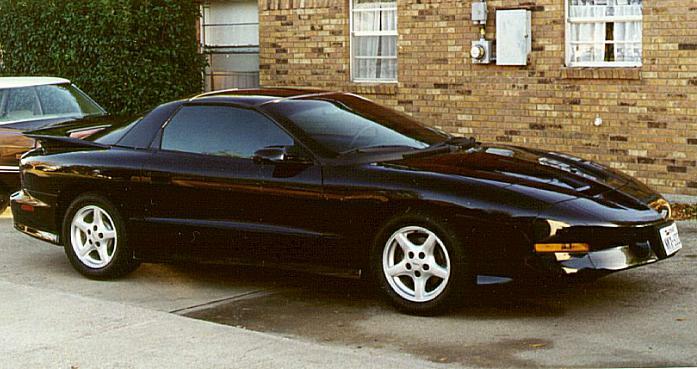 This sleek black Trans Am used to belong to Eric Cerney. 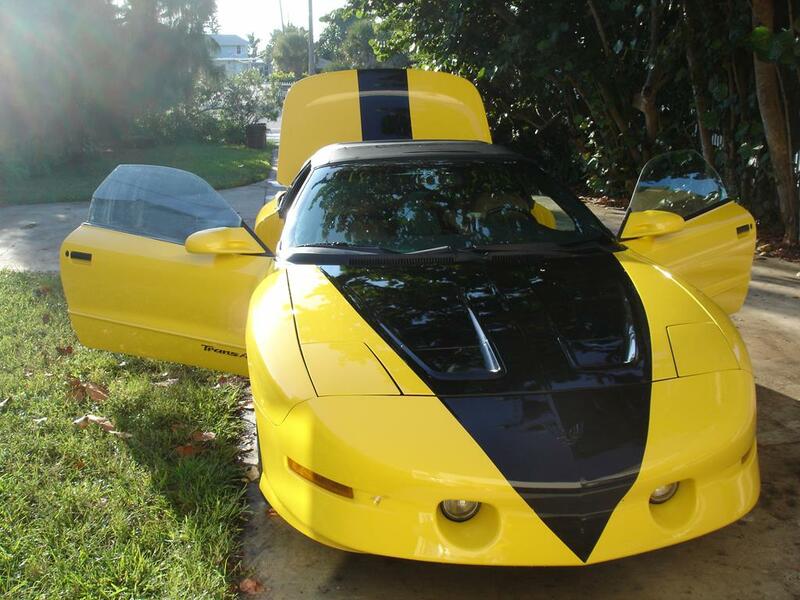 He sold it to finance a white '96 Trans Am he wanted to purchase. 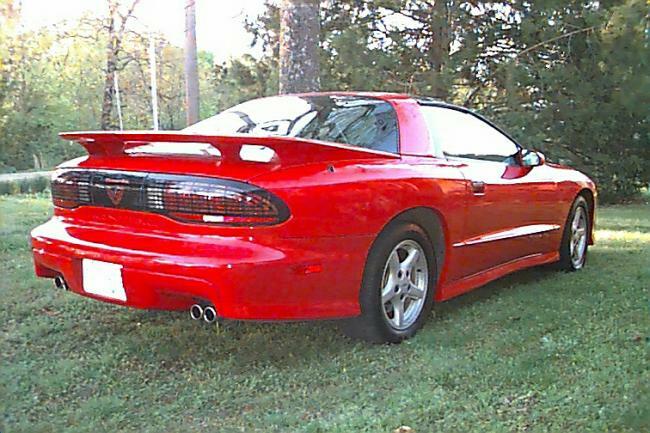 You can see it at the '96 Firebirds Lot#1. 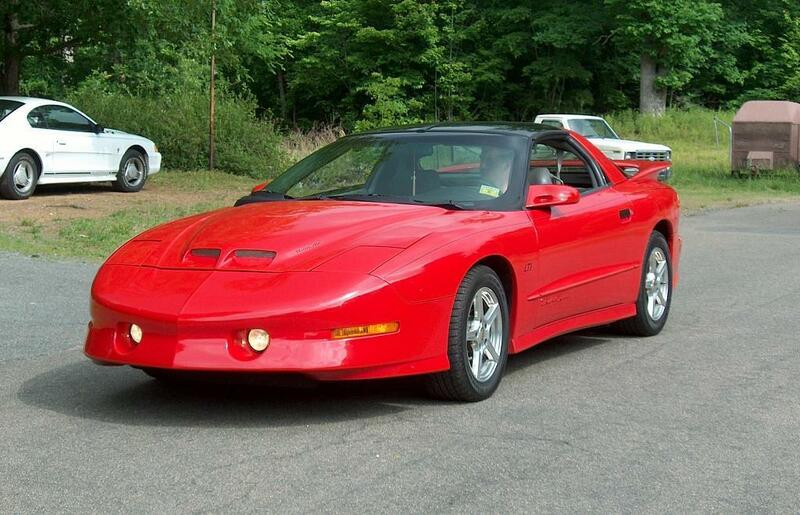 That car has now been sold too in favor of a brand new '98 Trans Am. 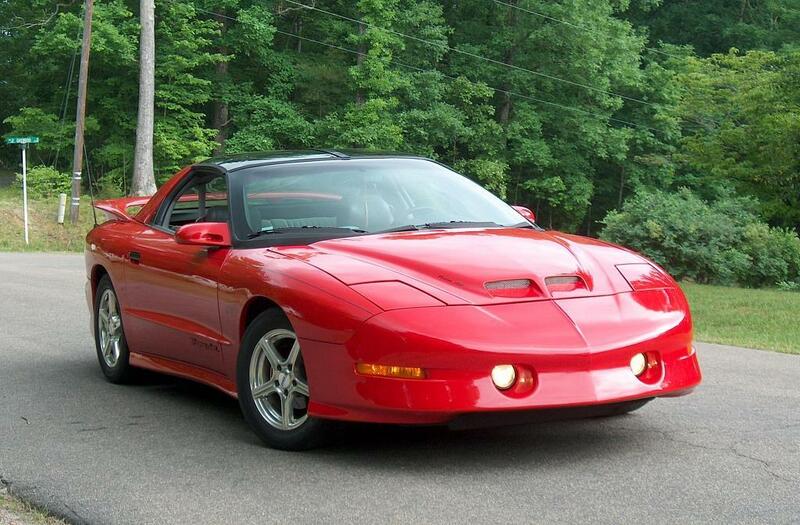 You can see it at the '98 Firebirds Lot#1. 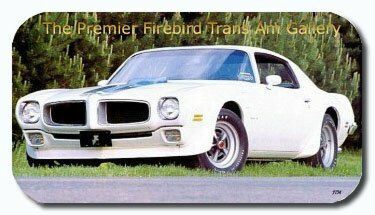 Eric has also owned two '78 TAs both of which can be seen at the '78 Firebirds Lot#2. 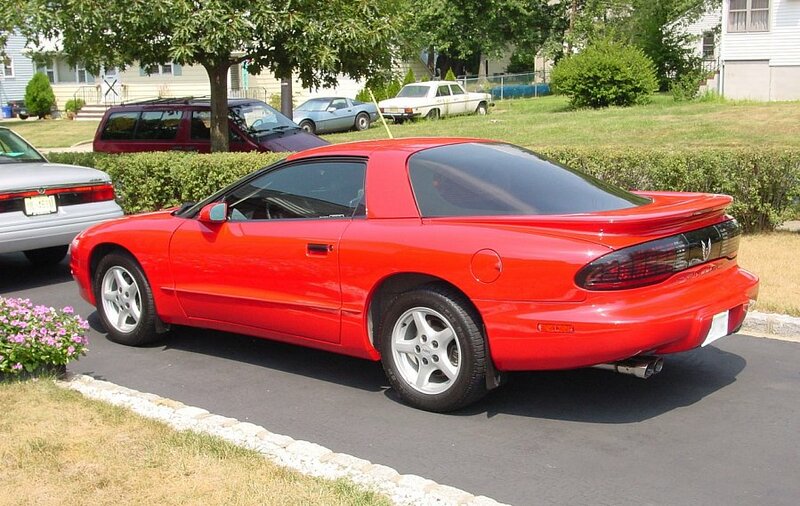 "Its a '95 with (unfortunately) the 3.4 ltr and an automatic, Ten speaker stereo system, cruise, extra window tinting and all the other goodies. It is a great car, handles like a dream and still gets good mileage. I haven't really done any modifications or additions to it mainly because it doesn't need any. It always draws attention and I have received uncountable compliments on it. 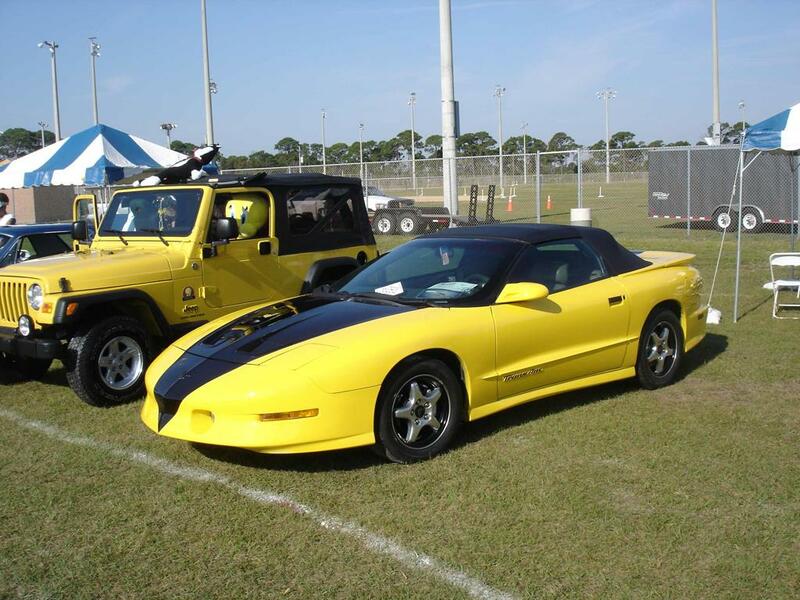 I think Pontiac did a good job on this one." 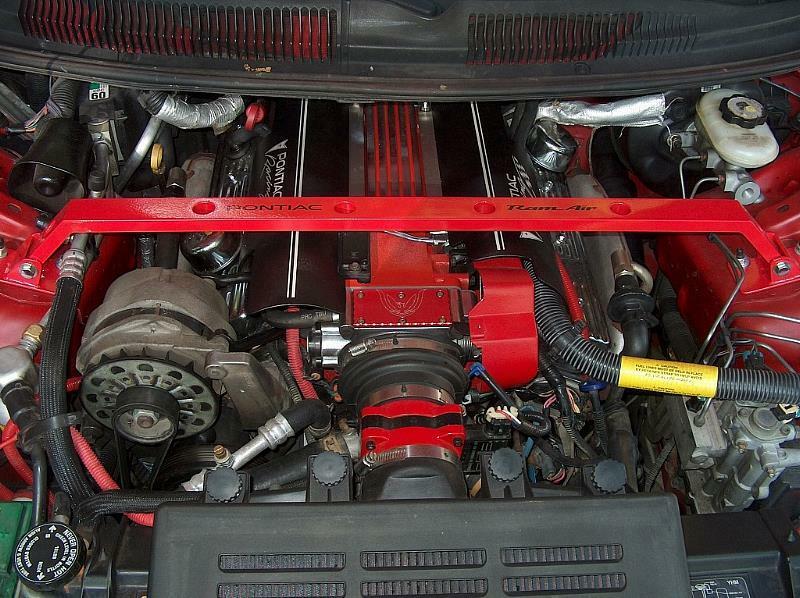 Jeff has most recently installed a Nitrous Oxide system (N.O.S) on his TA. 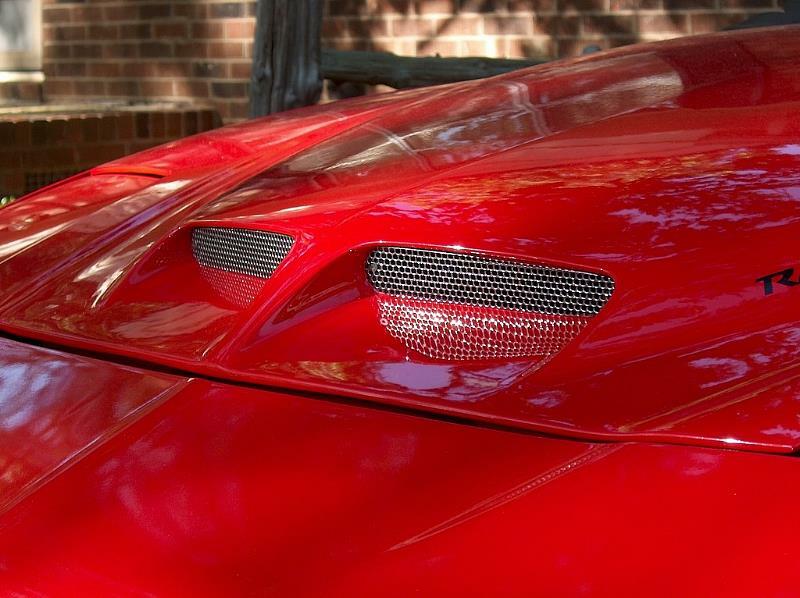 The bird was dyno'd at 325 rwhp (rear wheel horsepower) and 349.5 lbs of torque off the bottle. Impressive numbers already to say the least. 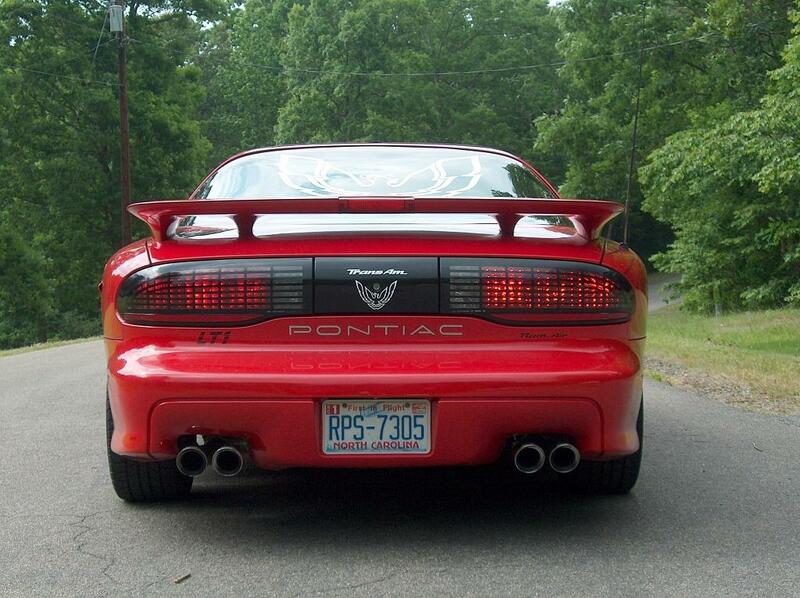 On the bottle the Trans Am made 435 rwhp and a whopping 519.6 lbs of torque. Convert the power the car makes at the wheels to flywheel numbers and you come up with a monstrous 525 Horsepower and 625 lbs of torque. Plans for the future you ask? Absolutely!! 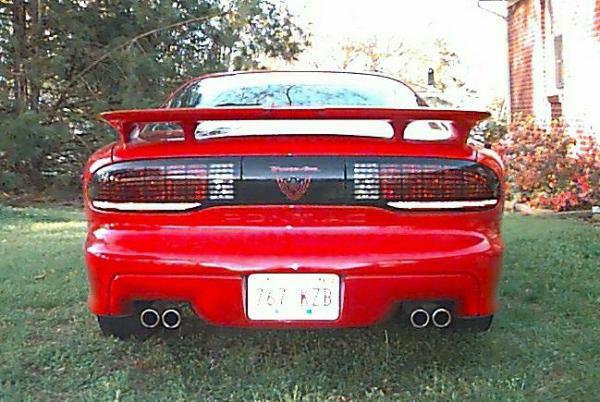 Jeff is looking to install a set of 98 taillights, 4.10 rear gears, and headers. After all these mods its going to be a heck of a race between his fuel gauge needle and speedometer needle!! 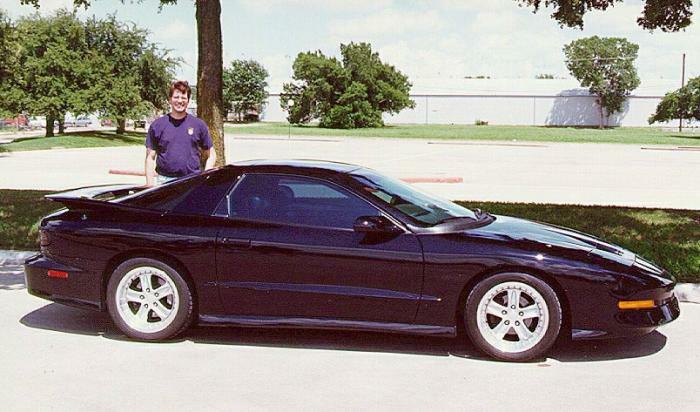 Jeff's best time to date with his Poncho is a 13.3 @ 107mph on street tires. 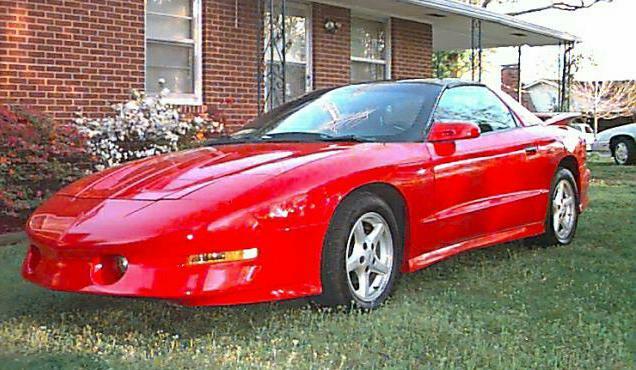 Here is my 1995 Pontiac T/A Convertible. 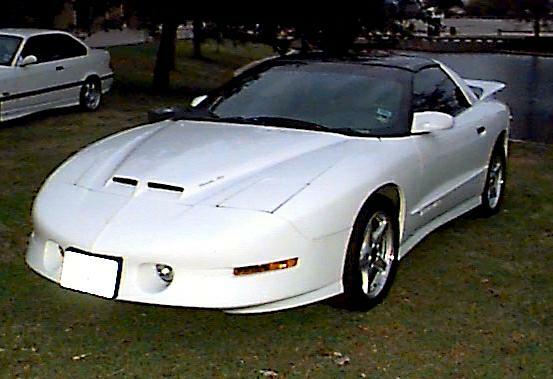 Purchased by me in Jan this year to replace worn out 1986 T/A. 17x9 or bigger rims w/ low profile tires, 1" drop... and more!!! I will send more photos soon.... to make 5, they will be with the decals... thanks! 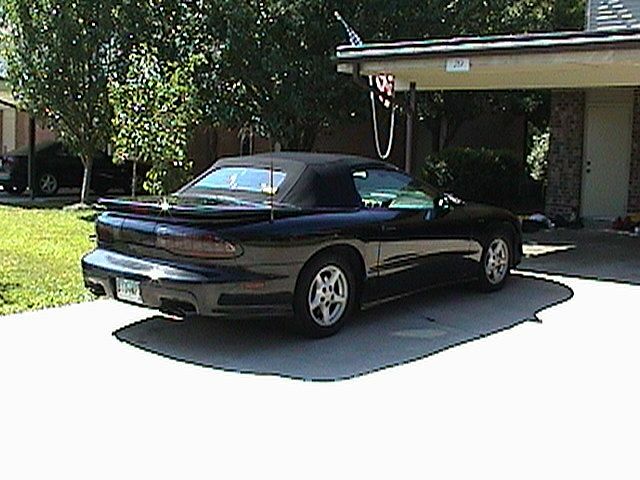 "This is my 1995 Trans Am, 6 Sp, LT1. 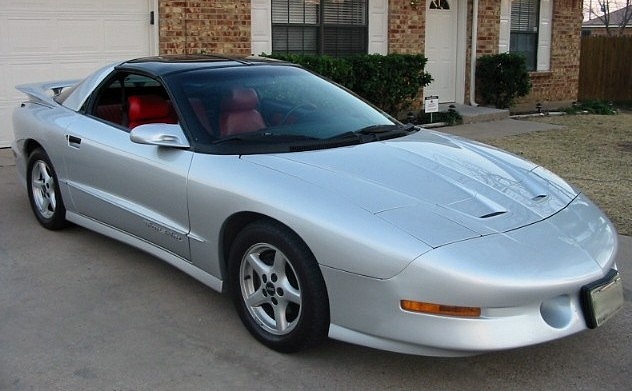 Liked it very much when I first saw it because of the red leather interior. 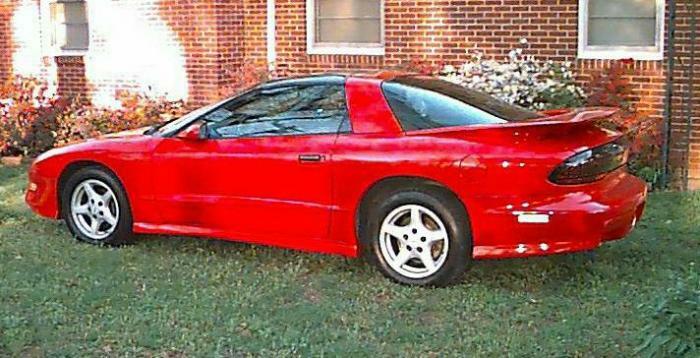 Have not done very much to the car but one day I am going to go crazy on it. getting a bit weather beaten."